that is not floral. of course. Trying to catch up with my Sunday Hops today! Follow back please @ http://www.pargasjunkyard.wordpress.com and/or on facebook @ http://www.facebook.com/pages/Pargas-Junkyard/259287017434763 ... thanks! Thanks for stopping by Flip Flop Reviews, I'm following back! :o) Have a great evening! This looks great! I will have to make one of these because we go four wheel driving and my daughter bobs around ALOT! :) Perfect solution!... :) Thanks for sharing! I came over from Flamingo Toes link up, Very cute and a great way to make a cover for a boppy!! Dang it! It's another one of those "why didn't I ever think of that" posts! I love this! 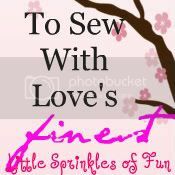 I am going to make some for my kiddos (and myself!) Thanks for sharing! Hope you stop by and share again this week! that really looks cute, Alicia. I love it's bright colors plus the fact that it's fleece - extra soft and cozy. I am sure you little one will love it! Thanks for sharing this with us. have a lovely day.